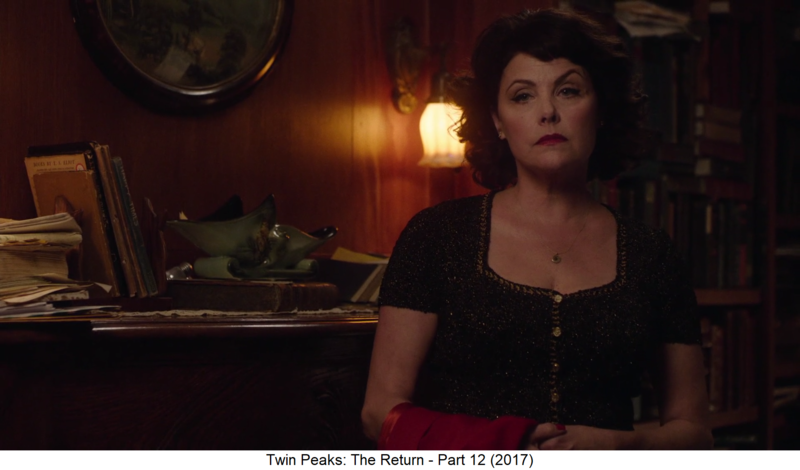 Board index Twin Peaks ~ The Return Part 12 - Let's Rock ! 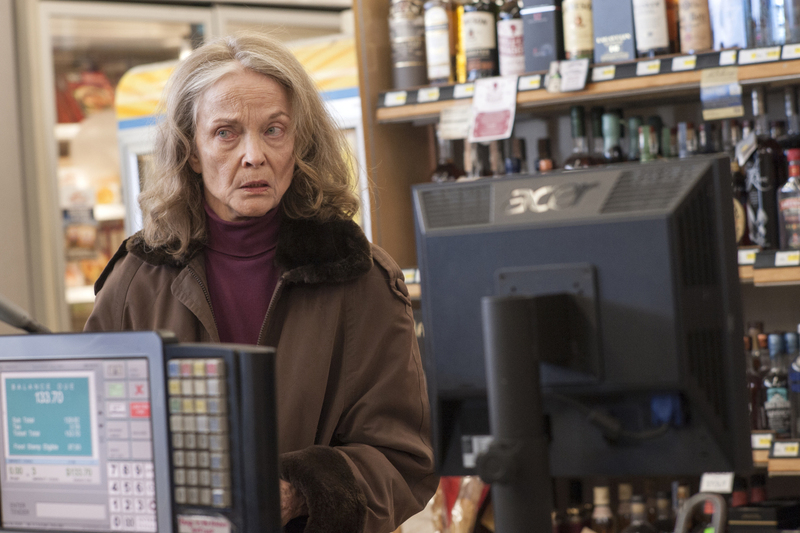 Whatever is happening inside the Palmer household and inside Sarah’s mind is definitely of interest, but what Zabriskie achieves so powerfully in her appearance here is a tragic depiction of inescapable grief. Twenty-five years later, Sarah is still haunted by the murder of her daughter at the hands of her possessed husband. Here is a woman stuck in time, forever cursed with the burden of her family’s ghosts (perhaps quite literally, depending on what that noise is coming from her kitchen). The whole scene clocks in at seven minutes and fourteen seconds. There are long pauses between lines, reaction shots of still faces, pleasantries exchanged, fraught with deeper meaning. Lynch uses these same tools to invoke dread at various points across his oeuvre ; here, those silences are filled with a gentler edge, the past casting its heavy, sad spell on those trying to live in the present. How does Lynch manage to evoke pathos, rather than horror ? For one, the performances of Forster and Beymer do much of the heavy lifting. They carry the burdens of both Frank and Ben in the subtle ways their faces communicate without words. Beymer moves back in his chair, and then forward, as he contemplates the sins not only of his grandson, but also of himself, and how that could have been passed on. Their connection over the key, and Ben’s touching gesture to offer it as a memento for Frank’s sick brother, Harry, reminds us of the history Harry holds with him. Once again in the series, an absent character conjures up deep feeling in those who care for them. Lynch plays the scene without any non-diagetic sound. We are conditioned to hear Angelo Badalamenti music, or a sickening drone, or crackling electricity in the air, when we watch a Lynch scene. The dead silence apart from voices focuses our attention. The coup-de-grâce comes when Richard remembers his father buying and painting a bicycle for him. It’s a simple memory, but Beymer and Lynch imbue the moment with a rich tenderness of loss, knowing that Richard never had a father who could make such a gesture the way Ben’s father did to him. Even Beverly sheds a tear. If Lynch had compressed this scene by even a couple of minutes, it wouldn’t carry the same power. We need those silences, those still, composed reaction shots of Ben’s steady movements, in order to let this eulogy truly sink in. Ben is mourning the death of his family, in spirit if not in body. Fans of Twin Peaks should be well aware that Lynch’s work has never been easy. The fact that the show continues to consciously, at this point comically, defy our expectations is part of what makes it such a breath of fresh air. It keeps it unpredictable, which in turn keeps us vulnerable, unaware of what is to come, which makes its more traditionally exciting moments even more rewarding. We are all Audrey Horne, screaming, “You’re not gonna tell me what she said?” as the show, like her husband, stares in unwavering silence. It might not always be gratifying in the moment, but when media isn’t actively challenging us, it can grow stale. No one should expect Audrey Horne to come waltzing in, 25 years older, still acting like a playful teen. Anything resembling that would have been cheap fan service. For a show that has often been dismissed as incomprehensible, the message of Lynch’s latest episode seemed to be both simple and timely: be kind. When he’s told about his tenant selling blood for rent and food, despite the tenant helping out around the trailer park and around town in general, he makes a point of forgiving his rent for the month and handing him forty bucks for food. Carl sees the work and talent that his tenant gives and asks nothing in return for, and decides to put fair value to that work in the name of his friend not literally having to give his blood to make ends meet. This could even be seen in Gordon’s interrupted date with the French lady, whose entire routine before leaving for the hotel bar works as a symbol for Lynch’s particular way of working and leaving an impression. When the lady leaves, Albert shares Diane’s messages to an unknown other, the same one she communicated with at the morgue, but Gordon quickly sees beyond the implications of Diane’s messages and toward the well-being of his friend and colleague A few episodes back, Gordon and Tammy were laughing giddily at the sight of Albert having a dinner date with Jane Adams‘ hard-edged detective. That same hope can be seen in Lynch’s eyes when he talks to Albert about his concerns for his personal well-being and social life, especially when they are so easily eclipsed by work.